“ALL ABOARD!”….MASTER AND JIB, FULL BREEZE, BOARDED WITH EASE… I ON THE OTHER HAND….. WELL……….. I head towards the beach ….. For me it was all about the exposure. The plan being to arise at the usual 4:00 am, but on this morning I knew the conditions would be near perfect for shooting: Right temps, Tide time, Cloud coverage, calm waters but nice breeze, great full spectrum of rising colors. Yep..it was going to be a stellar pre-dawn and sunrise…It’s almost 5:30 am now. I missed my mark by 1.5 hrs… Argh. 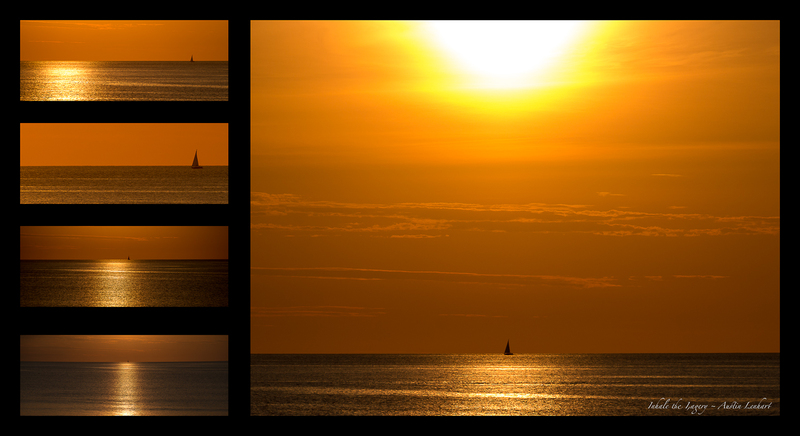 within seconds I’m on beach seeing what I had missed ; Then, on the horizon, I see it. luckily I had grabbed the camera with the 300 mm lens; so I reach out with camera and catch them… Sailors.. They’re out pretty far; I cast out further and fire: Master-and-Jib sails, 20 to 30 feet in length I guess; I pull back mid-way and fire again.. I thought to myself; “they woke up early; earlier than 4:00 am. They didn’t oversleep.. argh”.. I pull back to 70mm to get their full distance…fire … hmmm, they’re out there; earlier than 4:00 am for sure I think.. I see they are heading towards the Sun’s cast, Nature’s spotlight. The sailors well deserved attention; I wait until they are fully lit; fire one last time to record their encore..